There are many reasons why you should consider studying in Holland but ultimately the most important factors will be different for each and every one of you. Here we list five key advantages of gaining a Dutch university education. 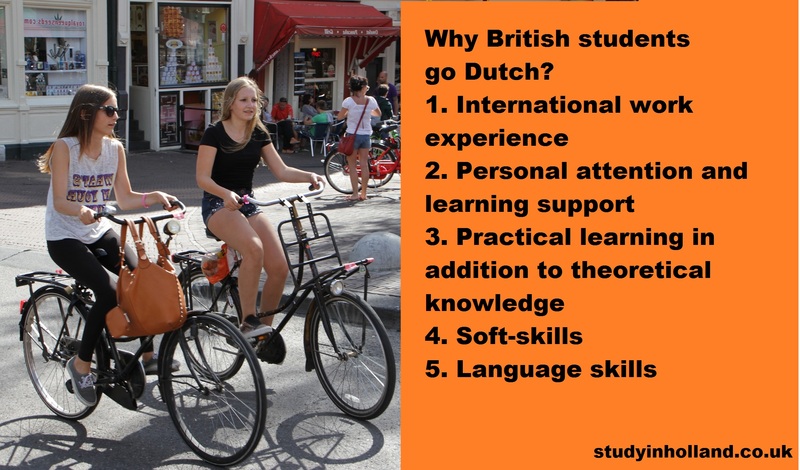 You can read many stories of British students and check news on this site to find out more why Brits are going Dutch. Gaining international work experience is essential when looking to enter today’s job market. Dutch Universities of Applied Sciences recognise the importance of real-world experience. In fact, it is impossible to gain a degree from such a university without completing at least one work placement. This placement may be in the Netherlands, back in the UK or in a completely different country. Dutch Universities of Applied Sciences offer comprehensive support and advice when trying to arrange the best placement for you. Dutch research universities place a higher emphasis on academic study but even here it is possible to combine work experience with your studies. Dutch universities actively encourage this. Dutch universities place a strong emphasis on good personal relations between staff and students. Most tutorials and seminars take place in small groups of around 15-30 students. Even the lecture theatres are rarely overcrowded. Most of your coursework will consist of group work, developing not only your academic skills but also your ability to work together as part of a team. It is quite common for a lecturer or other member of staff to become part of your team in order to offer immediate guidance and assistance. Additionally students at Dutch Universities of Applied Sciences will work closely with their own personal study mentor. Your mentor will assist with any day-to-day issues you are having with your studies but will also help shape your pathway to graduation, ensuring you get the most out of your time at university. Dutch universities include many practical elements in their degree courses. This emphasis on relevant experience is designed to prepare you for entry into the job market upon completion of your degree. The practical parts of your degree will be more pronounced in a University of Applied Sciences degree than at a Research University. During your studies you will complete several practical tasks. You will work in small study groups with your fellow students, putting into practice the skills and theory you have learnt in your lectures. In some cases you will work on projects with local employers, thus enhancing the overall relevance of your studies. This approach to studying is commonly referred to as problem-based learning. Your work experience will also offer you the chance to network with employers in your chosen profession. Many students in the Netherlands also use these opportunities to build a network of international contacts. Most Dutch universities have extensive links with international employers and universities giving you the chance to obtain international experience as part of your Dutch degree. Dutch universities are very forward thinking in their approach to education; their most important objective is to provide you with the skills and knowledge you will need later in your career. When you are looking for employment after you graduate from university, soft skills often play an important part in a successful career. Dutch Universities of Applied Sciences place great emphasis on giving students the chance to develop their capabilities in areas such as teamwork, communication and presentation skills, for example. While you are unlikely to go to the Netherlands to study in the Dutch language, there are many advantages to learning an additional language. If you learn Dutch you are likely to find that your ability to find part time work as a student will increase. Upon graduation you will also be able to work in the local Dutch economy as well as in the multinational economy both there and back in the United Kingdom. In an age of economic uncertainty language ability is a useful insurance policy. It might even be the case that you learn a language other than Dutch. Certainly, the closer you get to the border the more German students there are likely to be at your university and in your classroom. Also, as many of the degrees taught in English are designed to be international, there can be a requirement for you to learn a new language as part of your studies.